Sounds simple, but it is hard for me to narrow it down. Could be a player you grew up watching, watch now, or one you never got to see play but have studied and dug up photos and have watched via NFL Films or something like that. I may change my mind by the time this thread runs its course (LOL), but I have to say San Diego Chargers QB Dan Fouts. In 1981, I turned 8 years old and "discovered" football. It didn't take me long to find Fouts and the Air Coryell Chargers. I watched this guy sling the ball all over the field and direct a wide open offense during a time when most teams didn't play that style. However, he wasn't all flash. He wasn't mobile and often held the ball until the last possible second, allowing a receiver to come open--and thus endured a lot of big hits many players would shy away from. He bled a lot as I remember it. On the field he was a QB, a leader, and a man. He never got to play for the big one, but I will never forget how I felt watching him play. I also have to mention Lance Alworth. A great Razorback and Charger who I never got to see play but have a mountain of appreciation for nonetheless. Love the topic, because like you most discovered the game as kids, and nothing is more pure than a young boy's allegiance to his favorite player, or team. Mine was, and still is Roger Staubach. This infatuation took hold during the '74 season, ironically one which did not result in a playoff appearance. We had moved from California to Arkansas, and the Cowboys were on TV more regularly due to regional broadcasts. He was a classy player, tough, and of course there was his legendary will to win. Just something about him. Griese, Tarkenton, Bradshaw, etc, there were a lot of great players and QBs , but as the line in the song goes "I was Roger Staubach in my backyard", with the little pushing up of the shoulder pads before going under center and all. Heck, I loved Tom Landry too, and have refused to follow the Cowboys since the day he was fired, but Staubach was my guy. Johnny Unitas. I remember being in church as a kid on Sunday mornings in the early 60s and praying for him and my Colts. Went to his restaurant in Baltimore once hoping to see him but of course, he wasn't there. I went to the Colts training camp a few times and recall him walking right by me on the way off the field. Back then you could get right up near the players, especially us kids. It was like watching God stroll past. I had to wait to watch him play in person until I saw him in Houston in 1970 against the Oilers. Drove through a terrible storm to see him with my Dad. Funny the things you remember....the Orioles were playing a World Series game on TV when we left my house. He threw a late TD to Roy Jefferson to win the game. I'll never forget how he threw the pass, turned, and began trotting towards the sidelines. He knew it was on the money for a score. I never thought a death outside my family would leave me grieving. I was brokenhearted when he passed away. There will never be another Johnny U. As a Redskins fan I hated the Cowboys, but reluctantly loved Staubach, the whole on and off field package. I loved Jurgensen too, a truly great quarterback IMO stuck on mostly awful teams. And robbed late in his career by George Allen of the opportunity to play with good teams. Last edited by Peter_Spaeth; 07-27-2018 at 09:09 AM. Bart Starr was the guy for me back in the 1960's. It was so rewarding to find that he was even an nicer guy in person when I finally met him ten years ago. Not often that your childhood hero turns out that way. Also Lance Alworth, sadly my earliest memory of football on TV was when he dropped a pass in the endzone against Ole Miss in the Sugar Bowl. It didn't dim my enthusiasm for him while growing up. I got to see him play briefly in person in 1964 against the Oilers with Ronnie Caviness and Danny Brabham. Lance received a concussion early in the game but we got to get close to him during the warm ups. That's funny. As much as I disliked the Redskins, I just couldn't dislike Chris Hamburger. Roger Wehrli for the Cardinals was another on a hated rival that was a guy I really liked. And, Unitas was my first hero, I just didn't get to see him play for that long before he retired, but he is still up there as well as far as favorites. Staubach only had 7 or 8 full seasons I think, so his stats are not so great, but of all the QBs I have seen since I was old enough to know what I was watching, other than perhaps Brady, if I needed someone to win a big game I would go with him. Of course Montana is up there too. Last edited by Peter_Spaeth; 07-27-2018 at 10:52 AM. Not to be a contrarian, but I'd choose Stabler. Guy had ice water in his veins. Loved the way he so effortlessly flung the ball. Tough for me to choose between those Bay area boys, Montana and Stabler. As a Giants fan I loved Lawrence Taylor. When I was a kid I did not understand the game that well. But I liked what I saw when LT was destroying everything on the field. He made me a Giants fan and a football fan. This is also the reason I’m starting to dislike football. I’m a fan of the big hit ! The brute gladiator throwing his body recklessly into his opponents body with utter disregard for either of there body’s. Without this the game is stale and boring and I don’t understand the point of them being paid what they do. My argument was always that they got paid for this body sacrifice they made. Yeah he never really got his due not sure why. Maybe the renegade personality, quite the opposite of Staubach. Last edited by Peter_Spaeth; 07-27-2018 at 02:48 PM. Seeing all the great names everyone has already posted above, mine looks like a bit of a let down. But for me it was the Bills QB, Joe Ferguson. OJ had just left and we were excited to see what he could do. He had a couple of good seasons just before and things were looking good for the Bills. He finally got us into the playoffs, and played the game with a severely sprained ankle. All-time great? No, but still my favorite player of all time. And a former Razorback QB near and dear to my heart. His time at Arkansas was before my time, but he is still held in high regard. Hands down, it's Staubach. I collect a lot of different stuff but the one part of my collection that I'm truly attached to is my Staubach stuff. Mean Joe Greene. I grew up a Steeler fan (in Virginia amongst many Redskins fans) and Joe was the greatest Steeler of them all. I've gotten to meet him a couple of times, the first in the late '70s. He's the last of the great Steel Curtain DL still with us. "Gee, thanks, Joe." I was always so jealous of that kid. Growing up in Western Canada in the late '50s and early '60s, my guy was Joe Kapp. He broke into the CFL with the Calgary Stampeders, then was traded to the B.C. Lions, where he teamed up with the great Willie Fleming to guide the Lions to their first Grey Cup championship. In 1965, when I was 9 years old, the Lions held their training camp at the military college where my father served as head PE instructor, so for three glorious weeks I got to hang around the players. Getting to meet and play catch with Kapp was a dream come true, and he couldn't have been a nicer guy. In fact, all the players were terrific in going out of their way to make a star-struck kid feel at home. Great memories. 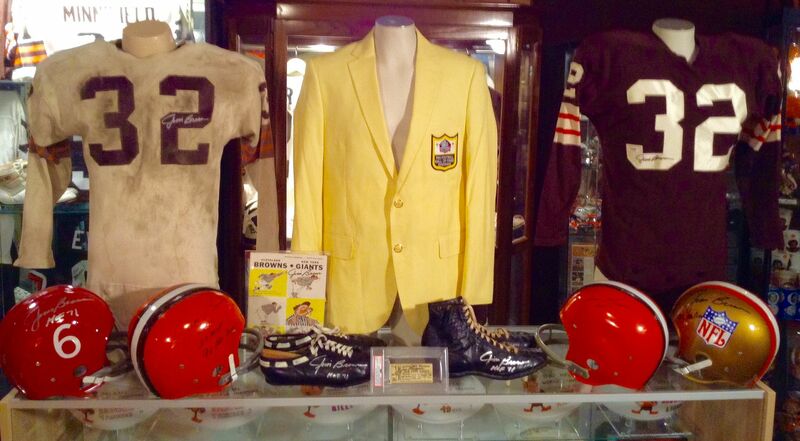 Favorite vintage player I never got to see play is Lou Groza. Favorite all time player would be Ken Anderson. Favorite coach would be Knute Rockne. Great stores y’all, please keep then coming! And one of the greatest nicknames of them all too. Classic. For the longest time it was Joe Namath. Loved to watch him drop back in the pocket with those gimp knees and then hurl one deep down field. As much as I still love Joe though, another Joe took his place. Joe Montana, to me, is still the greatest player, and although there is a current player that has more Super Bowl rings, Joe never lost one. I watched Montana, in the twilight of his career with KC, totally pick apart a very good Charger defense like he was a surgeon. That was fun to watch. I despised Staubach (and the Cowboys) as a kid but after watching his A Football Life episode I became a huge fan. He is the definition of the All American Boy and lives his life the right way. I made both my boys watch it. Met him once years ago at a social event and didn't take advantage of the opportunity. Always sorry I didn't ask him a few questions and talk football ... or maybe bring a few cards for him to sign ;-) This was before I got back into collecting and the thought didn't even cross my mind. Me too! As a young kid he was my favorite player. Wish I had seen him play at Alabama when his knees weren't such a mess. From all accounts he was pretty mobile then. Dan Marino. Cool as hell and a cannon for an arm. One of the best ever, even on a bunch of crap teams. 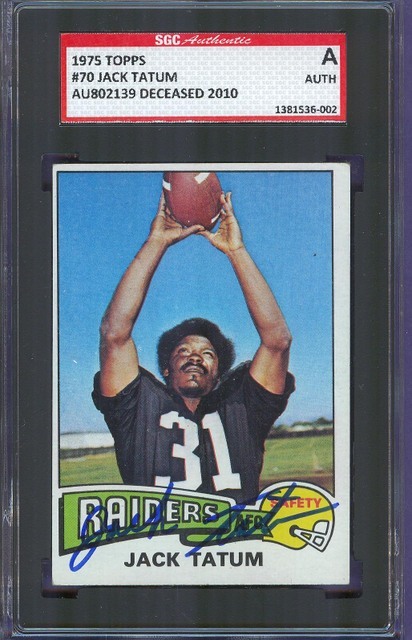 Jack Tatum . The Assassin. Name says it all: 100% badass. I got to meet him once at a Raiders signing show. 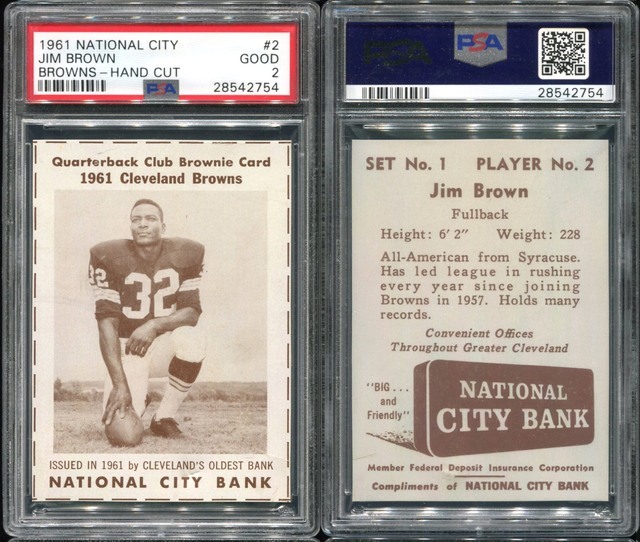 Historical nod to Jim Brown. The GOAT. Last edited by Exhibitman; 07-28-2018 at 02:53 PM. Tatum of course is remembered for the hit that paralyzed Darryl Stingley but if you watch the film it looks more like Stingley who was diving crashes into Tatum at an unfortunate angle. LT was an absolute game changer! Parcells and the Giants did a pretty good job of turning him loose to disrupt opposing offenses. I will never forget the MNF game when he crushed Joe Theismann. Marino is my favorite player ever too! Today’s game is so much different but my main man is Drew Brees. I Love the Saints! I’m not looking forward to his retirement, although I know it’s coming soon. I don’t have any idea who I would cheer for next as my favorite current player. But above and beyond all of this, Dan the Man is always going to wear the crown. Bill Bates is my favorite. Jim Kiick! That's cool, I kind of have a little mini-PC of the dynasty Dolphins myself. So, looking to complete a complete set of just Kiick, that's a unique goal. Good luck. No doubt on who this is for me. Easy choice because I grew watching him and was always amazed at what he could do despite the critics saying he would never make it as a Pro. He was undersized, did not have a huge arm but had a way about him. I arguable consider him the best scrambler ever. He had this way of finding a way to win kinda like Captain Kirk always found a way to stay alive. I would like to know how many miles he scrambled? When he retired he had every major passing record which all have since been broken. Francis Asbury Tarkenton "Fran the Man!" Last edited by tjenkins; 07-29-2018 at 11:05 AM. Barry Sanders, the man who could make a two yard gain look like the greatest play of your life. I really miss those Sundays. As long as the game was on turf. All the pundits rank him ahead of Smith, and perhaps rightly so, but from what I saw I give a slight edge to Emmitt as the best back of that era. Of course if Sanders had played past 30 his stats would be even more impressive, he racked up some massive yardage in only 10 years. Last edited by Peter_Spaeth; 07-29-2018 at 04:23 PM. Larry Csonka is the reason Im a Dolphins fan, my fave football player of all-time. Peter if Sanders had run behind that huge Dallas line he may have had 20,000 yards. Growing up in San Diego in the 1970s, my favorite player then, and still to this day, is Dan Fouts. Agreed and credit to Emmitt for admitting as much several times. For me it would be Eddie Meador, with honorable mention to the Fearsome Foursome, Ken Iman, Charlie Cowan, Joe Scibelli, and Tom Mack. For my Dad it would be Don Paul (UCLA & the Rams), Kenny Washington and Gary Beban, with a nod to Bob Waterfield, Paul Younger, Dan Towler, Charlie Toogood, and Tom Fears. As you can tell we are 2 generations of old school Rams & UCLA guys. Eddie Meador perhaps the greatest the greatest Arkansas Tech Wonder Boy of all-time. Well maybe second best but I am trying to be humble Especially since I never started. Well or even played in a varsity game. But at 5-8 128 I think I should get some credit for surviving. Small world...that's where I earned my BA! I was a little ahead of you I'm sure. My freshman season was 1972 the year after they played for the national championship. I later worked in the athletic department at Henderson State for many years. I was at Tech last week and had lunch at the Old Bank Sports Pub. They have a nice Eddie Meador display on the wall. Without a doubt: Lance Alworth. Triple teamed. Great Speed, could leap and because he was at least double covered all the time made Gary Garrison look like Don Maynard. Yes, you were ahead of me. I graduated in '95. I make it back there on occasion. I definitely need to make it there and check out the Meador display. It was a couple of years ago that I made the Tech-Rams connection. I had to reread the back of the card several times to make sure I was reading it correctly! Steve Largent is my all time favorite player. I grew up in LA as a Rams fan (still am). I played WR as a kid and in high school and I never saw Largent drop a ball. He always seemed to create space with his routes and catch the ball even when he wasn’t open. Second favorite player is Marshall Faulk, an SDSU alum like myself. In my opinion he was the best all around running back ever. Last edited by argpdt; 08-30-2018 at 02:36 PM. Boy, that is a tough one. Do you go with a star player from today? A player from your childhood? A superstar legend you read about in a book? As someone who really digs the early days of professional football, I guess I would go with Jim Thorpe. I should say that, although Andre Tippett is my favorite player of all time and I do collect him, the player I’ve had the most fun collecting (and getting to know) is Gino Cappelletti. Great analogy for those of us who followed early 70’s FB!